Welcome to Wildfire Farms. we raise 100% natural grass fed and finished beef, free roaming chickens and pigs. Our meats are free of drugs, hormones, antibiotics, animal-by-products and corn. We have an online store for you to browse and purchase our tasty meats. In the summer you can find us at Marché St. Norbert Farmers' Market and in the winter we deliver our meats at selected locations in Winnipeg. We raise 100% natural grass fed and finished beef, and naturally raised chicken and pork. Our meats are free of drugs, hormones, antibiotics, animal-by-products, soy and corn. For 20 years, we’ve had grass fed and finished beef for our family members and in the past few years, we decided to share our grass finished beef with you. Our beef is free of hormones, steroids, fertilizers, animal by-products or antibiotics. Read more. In the summer on Saturdays, you can find us at the Marché St. Norbert Farmers' Market in Winnipeg. Throughout the year we have selected meeting points where you can pick up your orders. You can order by going to our online store or to contact us. 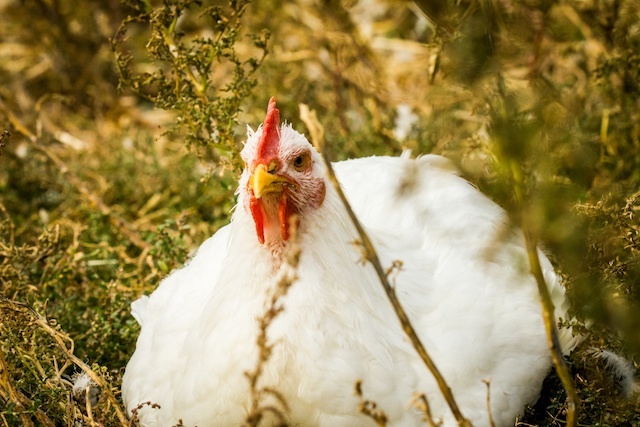 Our pastured chickens are raised outdoors from spring to fall. They spend their days outside and forage in plants, eating insects and grains. Read more. We have chickens available for September - October. Ordering is based on availability due to limited quantities. If you are interested email us or check our online store to order chickens. Our Heritage Berkshire pigs are free to roam and dig. They are free to be indoors or outside as the barn door is always open to the outdoor pen. We raise a few handfuls at a time to limit the cramming of pens. They are fed a combination of grains and organic clippings from our vegetable garden. Read more. If you are interested check our online store or contact us.